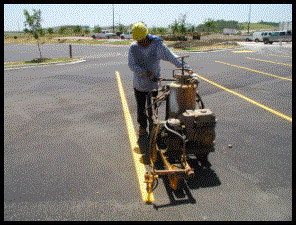 We are your one-stop pavement striping professionals. For over 50 years we have provided our customers with a full range of pavement marking services. Whether you need new pavement markings or maintenance services, we can fulfill your needs. In addition, our technicians will help design a comprehensive maintenance program for your pavement, tailored to your traffic patterns and work environment. With timely maintenance we can help improve the appearance and extend the life of your pavement. Pavement markings will be accurately placed by experienced personnel. All lines will be straight & uniform in both color and width. Stencils available for lettering and numbering in all sizes. 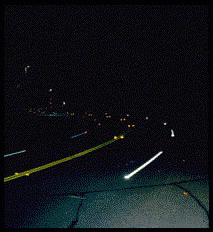 Professional I or II road striping with Type I or Type II TX DOT Spec. Materials. Private or public road marking available. Applications available for parking and traffic needs. All sizes and types, many of which are in stock. 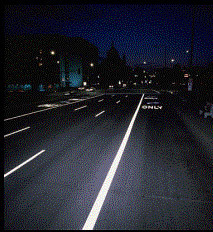 Available in non- reflective & reflective. 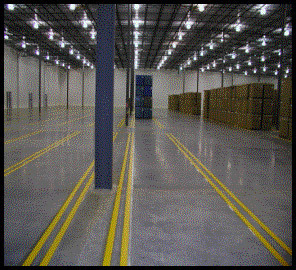 Let the experts at Stripe-A-Zone come out and inspect your warehouse floor to help determine whether striping will help keep your company safer and more organized.